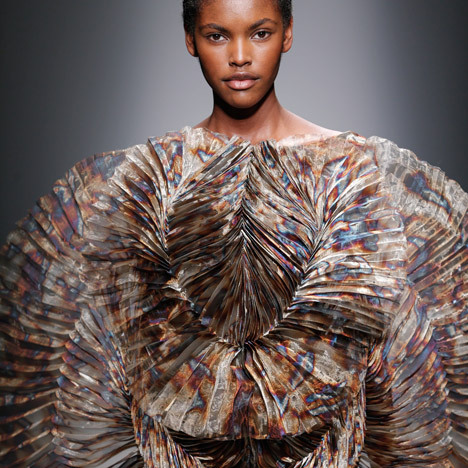 Dutch fashion designer Iris van Herpen has formed garments from a fine steel mesh burnished in swirls for her Autumn Winter 2015 ready-to-wear collection. Iris van Herpen presented the gauze items along with delicate and 3D-printed shoes in her Hacking Infinity show at Palais de Tokyo on Tuesday during Paris Fashion Week. According to the designer, the colours and shapes used for the clothes were based on the notion of terraforming other planets to make them suitable for human inhabitance. "The collection explores the possibilities of new geographies and our place within them," said Van Herpen's show notes. Working with textile designer Aleksandra Gaca, she created a lightweight translucent mesh that was cut into circular shapes and pleated for texture. "The central geometry is the circle, in both silhouette and cut," said the designer, who's previous shows featured dresses grown with magnets and models vacuum-packed between plastic sheeting. "The spherical shape of planetary bodies and the symbol of a boundless 'hackable' infinity unfolds before us in a constant flow of mandala-like forms," she added. The metal was hand burnished to give a mottled effect with "nebula-like" colours across its surface. On the front of a knee-length dress, a section of the plissé gauze creates a circular silhouette while still revealing the outline of the model's body. Another gown made entirely from the material features a round element that extends from the chest and covers the face. Similarly, the mesh forms a circle on the front of a halter-neck top that reaches just below the eyes. Van Herpen also continued her collaboration with Canadian architecture professor Philip Beesley to create a set of three digitally fabricated garments. These black designs were made from intricate three-dimensional tessellations of geometric shapes, formed into halter-neck dresses and a top. Other items in the collection were created using shimmering fabrics coloured with earthy hues. Van Herpen also introduced deep red and black textiles, as well as a dress that appeared to be covered in translucent jelly spikes. The footwear accompanying the clothes was created with Japanese shoe designer Noritaka Tatehana, using 3D printing to produce the crystal-like shapes that formed the platform sole and cantilevered heel. A web of laser-cut leather stretched over the foot and around the jagged bases to act as the upper.